Alpinist magazine looks at how publishers treat women in climbing texts. A significant goal of The Mountaineers and its publishing division, Mountaineers Books, is to recognize and encourage diversity in our community and in the books we publish. A recent article in Alpinist Magazine reviewed four climbing instructional texts in regard to gender diversity and gave Mountaineers Books positive marks. The thought-provoking article, “A feminist review of climbing how-to guides” by Georgie Abel, reviewed four “popular how-to climb” books, two of which are published by Mountaineers Books. Abel examined the titles from a “feminist lens, focusing mostly on aspects of gender and race”. 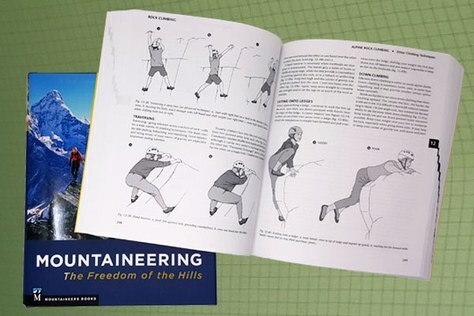 Mountaineers Books titles Advanced Rock Climbing by Topher Donahue and the new Mountaineering: The Freedom of the Hills, 9th Ed. are given solid marks. Advanced Rock Climbing, Abel says, does best in representing female climbers, based on having an equal number of expert voices by gender, an equal number if images, neutral language, and other factors. Though not mentioned in the article, it’s interesting to note that The Mountaineers committee of contributors for the new edition of Freedom included 11 women (including Mountaineers Books editor Laura Shauger) out of 25 contributors overall. Mountaineers Loni Uchytil and Anita Wilkins chaired two of the most climbing-specific sections of the text – “Rock Climbing” and "Snow, Ice, and Expedition Climbing”. In approaching our titles, we want to reflect the mix of folks who participate in outdoor sports and encourage folks to join us by inspiring them with the images and voices of outdoor enthusiasts to who they can instantly relate. While there is always more we could and should be doing to support equity in the outdoors, The Mountaineers and Mountaineers Books are committed to being leaders in broadening our community and welcoming new trail and belay partners in every way we can. After all, it’s fun out here. Come join us!